Another aspect of "In The Beginning" is when writers of theological considerations began to import the usage of political terms such as Communism, Democracy, and Socialism... as yet another exemplified Trinitarian-like representation and in doing so one or more particular theological orientations could both be intellectually supported and protected by such an association; without looking beyond religious ideology to note the presence of multiple triple ideas that have cropped up in biology, mathematics, sociology, anthropology, physics and other subject areas not now typically concerned with religious themes, though the origins and originators of such subjects may well have applied their fledgling scientific-based notions to theological questions and interests. From the King James Version of the Bible, Revelations verses 1 to 8: And I saw when the Lamb opened one of the seals, and I heard, as it were the noise of thunder, one of the four beasts saying, Come and see. 1 of 3. And I saw, and behold a white horse: and he that sat on him had a bow; and a crown was given unto him: and he went forth conquering, and to conquer. And when he had opened the second seal, I heard the second beast say, Come and see. 2 of 3. And there went out another horse that was red: and power was given to him that sat thereon to take peace from the earth, and that they should kill one another: and there was given unto him a great sword. 3 of 3. And I beheld, and lo a black horse: and he that sat on him had a pair of balances in his hand. And I heard a voice in the midst of the four beasts say, A measure of wheat for a penny, and three measures of barley for a penny; and see thou hurt not the oil and the wine. And when he had opened the fourth seal, I heard the voice of the fourth beast say, Come and see. 1 of 1. 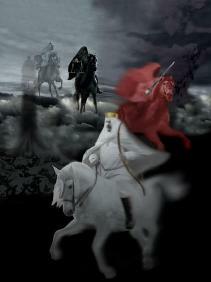 And I looked, and behold a pale horse: and his name that sat on him was Death, and Hell followed with him. And power was given unto them over the fourth part of the earth, to kill with sword, and with hunger, and with death, and with the beasts of the earth. Is "Hell" in the above instance more in reference to a type of riderless squire, and not a horse riding spectre as is displayed in this image? REV 14: 6-7 "And I saw another angel fly in the midst of heaven, having the everlasting gospel to preach unto them that dwell on the earth, and to every nation, and kindred, and tongue, and people, Saying with a loud voice, Fear God, and give glory to him; for the hour of his judgment is come: and worship him that made the heaven and earth, and the sea, and the fountains of waters." REV 14:8 "And there followed another angel, saying, Babylon is fallen, is fallen, that great city, because she made all nations drink of the wine of the wrath of her fornication." REV 14:9-11 "And the third angel followed them, saying with a loud voice, If any man worship the beast and his image, and receive the mark in his forehead, or his hand, the same shall drink of the wine of the wrath of God, which is poured out without mixture into the cup of his indignation; and he shall be tormented with fire and brimstone in the presence of the Lamb: And the smoke of their torment ascendeth up for ever and ever: and they have no rest day nor night who worship the beast and his image, and whosoever receiveth the mark of his name." From the early centuries of the church variations of a triangle have symbolized the Trinity. Given the importance of symbols to human understanding, we should carefully consider if the triangle is the most appropriate representation of the Trinity. In this paper, we will first review biblical uses of the number three, then argue that a straight line is closer to the biblical imagery of three. We will see how line imagery enhances biblical exegesis, then the implications of this imagery in theological controversies such as trichotomy and procession. Three represents a pattern that is expected to continue. For instance, in Luke 2.46 the young Jesus spent three days in the temple before his parents found him. Three days indicates this was not a youthful whim but a purposive activity. In Luke 13.7 the fig tree bore no fruit for three years, indicating an essential barrenness that only concerted action could reverse. In each gospel, the feeding of the five thousand takes place after the crowd followed Jesus for three days, with the implication that they would continue to listen to his teaching until they dropped from hunger. Threefold structure emphasizes the absolute alignment of the writer's idea. The three temptations in the desert emphasize that the devil is fully tempting Christ and that Jesus is fully resisting the evil one. The famous six woes in Luke 11.39ff are really two groups of three woes. No one missed the full extent of Jesus' condemnation, the recipients certainly realizing the direction of his remarks. In Acts 10 the apostle Peter saw the sheet with unclean animals, and three times God declared the unclean clean. After the threefold repetition, Peter is clear what God means and he applies God's directive without hesitation to the Gentile question. Biblical authors use the alignment symbolism of three to create 'rhetorical perpendiculars.' For instance, we already referred to the fig tree in Luke 13. The three years suggest a straight unwavering life of barrenness; if the tree were to bear the following year, this would be totally unanticipated, in other words, perpendicular to one's expectations. In Acts 9.4, the newly converted Paul is blind three days before his sight is restored. The three days of blindness mirror the full blindness of his former life, so the 'perpendicular' event of the opening of his eyes implies that Paul receives spiritual as well as physical sight. The parable of the Good Samaritan in Luke 10 derives much of its power from the 'three non-helpers': the priest, the Levite, and the presumed view of how a Samaritan would be expected to act. The Good Samaritan is perpendicular to all expectations; the threefold structure of the parable creates the "straight line" anticipation of abandonment that allows the 'rhetorical perpendicular' of the Good Samaritan's action to shock us. The most famous reference to three in the New Testament is the three days Jesus lay in the tomb. Mark's gospel climaxes near the end of chapter 8, when Peter confesses Jesus as the Christ, and Jesus teaches that he must die and rise again. The three days of death emphasize that he is truly dead, and the rising should be seen as a perpendicular event, as a contrast to the preceding sufferings. The significance of the sign of Jonah in Matthew 12 is the contrast between the hopelessness of three days in the belly of a fish --- three suggesting the straight line leading to death --- and the subsequent powerful preaching of the prophet --- an event perpendicular to death in every aspect, just as Jesus's signs are in a different dimension than the Pharisees imagine. Summarizing our argument so far, when expositing scriptural passages, the number three is best represented by a straight line. The line imagery suggests the continuation or alignment implicit in the biblical uses of three. The image of three points in a line can also reinforce the perpendicularity of a contrasting conclusion. A triangle image would not aid these exegeses. We now argue why thinking of three as a triangle can actually mislead exegetes. For instance, in the love chapter I Cor. 13, three attributes remain --- faith, hope and love, with the greatest of these being love. If one naively associates 'three' with 'triangle,' one might think that faith, hope and love are at the corners of a triangle, and are very distinct and independent aspects, with love at the apex. But if one thinks of 'three' as a 'straight line,' the essential dependence of the three qualities is clear. Faith, hope and love are not three independent qualities, but are three closely related milestones in our spiritual pilgrimage; love is not independent of faith and hope, but is the highlight of our spiritual growth. Straight line imagery supports this relationship better than triangle imagery. Note how the straight line imagery supports a temporal emphasis better than a triangular image. Whether humans are body, soul and spirit, or just body and spirit is a long-standing debate. The trichotomist generally highlights the essential differences between the three Greek words, while the dichotomist notes that almost always only two of these are mentioned and are meant to be clearly in contrast. If one symbolizes body, soul and spirit by a triangle, this controversy is important. In particular, I Thes. 5.23 could mean that we have three distinct and separate parts and our God must keep each part from sin. If one views the threefold nature of humans as a line, however, the stress is that our entire being is kept blameless from sin which affects each of the intimately related parts of our nature. The straight line analogy also allows us to view humans as three parts without underestimating the contrast explicit in passages such as John 3.6, I Cor. 5.3, and James 2.26. Hebrews 4.12 is especially poignant in the linear analogy; triangle imagery stresses diversity and suggests that soul and spirit are quite distinct. Triangle imagery lessens the difficulty of dividing soul and spirit. Linear imagery, however, correctly stresses the intimate connection of soul and spirit and so magnifies the precision of the word of God. Even the Trinitarian formula for baptism in Matt 28.19 benefits from rhetorical rather than geometric imagery. If one subconsciously thinks of a triangle, one might envision that God is a diverse being so one is required to baptize in all three names lest the new disciple miss part of God. If one subconsciously thinks of a straight line, one avoids the error of "parts of God" and more likely envisions a God that in his fullness supports the authority and commands that the Son gives his disciples. The ancient controversy over procession is affected by one's subconscious adoption of a triangle or a line for the Trinity. If one subconsciously adopts the triangle imagery, one sees a huge difference between procession from one vertex versus two vertices --- the argument over procession is clearly important. But if one adopts a straight line as an image, then visually it is not clear that there is a difference between procession from the Father or from the Father and Son. The difference is at best minor. Given that scripture does not emphasize the nuances of procession, it probably deserves to be a minor controversy, and the line imagery helps downplay excessive fascination with this topic. Due to a lack of imagination in the biblical writers?...H.O.B. (And for those who would argue that the bible (and various other religious texts are filled with imagination, I would whole-heartedly agree. Fairytales are like that.) Religion can well be viewed as a collection of fairytales for those whose minds are stuck in a child's frame of world-view referencing placed into a context which permits one to interpret such stories in a serious manner and thus preclude any notion of "misappropriation" of reality. A lot of cults make a living by feeding on misunderstandings of the Trinity. The triangle imagery unwittingly undergirds the cults' arguments. In the Jewish context, the problem was not the distinctness of the Father and Jesus, but their essential agreement in purpose and plan and power. Thus, most scriptures emphasize the unity and connections in the Godhead, not the distinctions, and cults exploit these scriptures. Since the triangle image strongly affirms the distinctness and deemphasizes the essential connectedness of the persons, the average believer sees a contrast between his or her internal imagery of the Trinity and the scriptures quoted by the cults. A straight line analogy undergirds the scriptural emphasis on the unity of the Godhead. The line view suggests that God has a single purpose and direction, the revelation of salvation from the Father by the Word through the Spirit. A triangle view does not convey the united direction of God's purposes and works, and misleads naive believers to focus on different issues than scripture does. In conclusion, for many aspects of theology, a line is a better image than a triangle when 'three' is present. Obviously, all images fail to capture the fullness of transcendent truth. In this short paper, we will not list the shortcomings of the line analogy since these are numerous and should be evident after reflection. Appendix B will review some literature on cultural uses of three and triangles, concluding that there is no necessary connection. Given that humans will symbolize abstract ideas, the biblical 'threes' should be viewed as rhetorical alignments and not as diverse vertices of triangles. Cirlot, J. E., A Dictionary of Symbols, trans. Sage, second edition, Routledge and Regan Paul, London, 1971.
reportedly taken from Church Symbolism by F. R. Webber, Second Edition, Gale Research Center, Detroit, 1971. Page 3, Farbridge, Maurice, Studies in Biblical and Semitic Symbolism, Ktav Publishing House, New York, 1970. Page 5, Hopper, Vincent Foster, Medieval Number Symbolism, Cooper Square Pub., New York, 1969. For instance, John Wesley's Commentary; Matthew Henry's Commentary. For instance, Eerdmann's New Bible Commentary, 1970; the 1871 commentary by Jamieson, Faucette and Brown; Robertson's Word Pictures of the New Testament is ambiguous as to whether the water and blood refers to the sword thrust or to the baptism and crucifixion but leans towards the latter. H.O.B note: The author's concluding remark about the short-comings of the line analogy being obvious after reflection and that there is no need for listing them is problematic in that an attempt to list at least one short-coming should have been made to detract from the overall biasness of the discussion as being related solely to religion and not a generalization of human cognitive processing. One central short-coming of the line analogy is that the usage of a line requires one to begin at one end or another in order to "walk the line" in a successive manner, and thus selectively choosing one item before the others as a "first option" of consideration. And if one were to begin in a middle position, which direction would one choose to go next? Whereas one may argue that succession does not matter, it nonetheless occurs as a mental ordering of material which can act as an influence of thought considerations as a 1st, 2nd, 3rd topic alignment... similar to that which would occur if one were to list all the characters or places listed in the Bible without ranking them according to number of appearances, connection to one another, gender, age, assumed importance, etc... Arguing for a type of 'equality' in word and definition does not create an equal valuation in actual deed, since we are dealing with limitations of energy and usage in differentiated times and places. For example, by having three people stand on (or "in") a line front-to-back or side-to-side does not preclude the necessity that each is equal in distance from a given point of reference, even perhaps if they were to share the same physical space. And if one were to ask them to step forward or backwards at the same time, is it at all possible to do so at the same time and same manner? Ordering, and thus some relative role of ordering might necessarily, over time, lead to a ranking-of-importance system. But the same short-coming may be offered for an analogy based on a triangle, circle or any other geometric figure. One begins somewhere and even if one ends up where they begin, a Janus-faced profile still presents us with points of demarcation in our intellectual efforts to portray an equanimity... just as does the very origin of words. Hence, which of the three words (body, soul, spirit) came into usage first, thus possibly indicating importance of a given idea before the others and having a longer pedigree of consideration in human consciousness. Just because one wants to claim that all three are equally important does not mean they are treated as such by everyone in all circumstances. Offering them as equal is like a soda drink dispenser. Individual tastes come into play on which to choose over the others... and a "suicide" drink (mixture of multiple or all flavors) does not cancel the fact that one selection is made before another... including what size of cup and how much ice... if any, is to be added. Farbridge [5, pp. 99-114] gives an overview of the use of three in a variety of ancient cultures. Three represents a 'small, well-rounded total,' e.g., Moses hidden for three months. This idea then extends to represent 'many' or 'enough' and hence conveys a sense of completeness, e.g., the three transgressions passage in Amos. In Hebrew, threefold repetition conveys the sense of the superlative, e.g., the threefold Holy, holy, holy in Isaiah's Epiphany (pp. 99-101). In the Talmud, threefold repetition denotes supreme importance (pg. 107). The Greeks regarded three as the determining or final or complete number. (Curiously, Jung viewed three as incomplete [1, pg. 168].) Cooper [3, "Number" entry] says that three represents forward movement, overcoming duality, creating synthesis. Three carries certainty and power. Hopper summarizes well the common assertion that in the development of language, three originated from the undifferentiated word for 'many.' He notes the distinction between the dual and the many in Egyptian, Arabian, Hebrew, Sanskrit, Greek and Gothic languages and so explains the association of three with the superlative [6, pg. 4]. The passage quoted in the beginning of our paper is part of his argument defining the "statistical" use of three, which in our paper is called the 'rhetorical' or 'straight line' use. Farbridge also discusses the philology of three, and concludes with an interesting speculation on the root of the Semitic words for three [5, pp. 113-114]. He suggests that three is derived from the root word 'heap' or 'mound. He then shows how the Semitic meaning of three became attached to 'raise' or 'extend' (hence the superlative connotation of three). Farbridge also relates the word for three to the root for 'suspend' or 'hang' and claims this is why the triangle-three connection is natural. Indeed, Cooper [3, "Three" entry] bluntly states that the triangle is the chief symbol for three. He quotes Plutarch's reasoning on the Egyptian use of a triangle for a deity, and notes that the Pythagoreans associated the equilateral triangle with Athena and wisdom [3, "Triangle" entry]. Schimmel [8, pp. 73-74] says that Plato and the Pythagoreans and Christian writers associated three with triangles. Farbridge points out that the Samaritans evidently arranged letters in the phylactery as two triangles [5, pg. 106]. Cirlot [2, "Triangle" entry] notes that the Carthaginians used a triangle to symbolize the god Tanit. Liungman notes that the Hittites associated triangles with 'good' or 'healthy' and notes that Xenocrates in the fourth century BC said the triangle symbolizes God. Is this Triangle = God association a representation of the triangular solar pathway and solar worship?...H.O.B. But frankly, the triangle does not best represent the symbolism that most of these authors associate with three. Farbridge gives several Babylonian triads, often having Astrological connections. For instance, the heads of the pantheon represent heaven, earth and water, and Farbridge says this triad represents space while the next triad represents time [5, pg. 102]. The Vedic cosmogeny divides space into heaven, atmosphere and earth [5, pg. 109] while the Greek and Roman theogeny divides the world into earth, sea and the underworld. The Cabbala interprets the three holy men of Ezekiel 14 as exemplars of creation, destruction and restoration [5, pg. 108]. Such examples emphasize either spatial or temporal linear relationships, consistent with a line and not a triangle image. Cirlot makes an interesting observation [2, "Ternary" entry]: "If the number four has been found the most fitting 'model' to symbolize exterior or situational quantitative values, three has proved itself the number attached to the interior or vertical order of things." His "vertical order" mirrors the linear order that we have argued is the best visualization of three. In the context of biblical exegesis, Hopper makes the strongest argument against the triangle as a symbol for three. To oversimplify Hopper's arguments, the Babylonians see most numbers as representing temporal (thus linear) events, while the Pythagoreans viewed the world geometrically (so triangles are prominent). Hebrew culture is firmly in the Babylonian camp, and in fact, Hopper believes that most of the Old Testament uses of three are 'statistical', with very few strictly symbolic examples of three [6, pg. 27]. As far the New Testament, Hopper asserts: "it is obvious to the most casual reader that [numerology] is at variance with the spirit of naiveté and directness which distinguishes the scriptural accounts. The Pauline epistles, earliest and most certainly authentic of the original records, are completely innocent of number theory. The synoptical gospels, together with the more disputable account of John and the Acts, all first century compositions, do contain numbers, but these are 'symbolic' numbers only in the most elementary sense." [6, pg. 69]. Dudley is even more blunt: "Pythagoras was responsible for number mysticism. The writings of the civilizations that came before the ancient Greeks, those of the Egyptian and Babylonians, contain no number mysticism." [4, pg. 5]. Finally, we note that the extensive collection, Cetedoc CD-ROM Library of Christian Latin Texts, does not contain a single reference pairing the word triangle with either God or Trinity. However, this does not in anyway preclude the possibility that one or all were not influenced towards a confluence of single identity-ship by the same source, irrespective if those who thought about such were even aware of the initial influence, such as the triangular image of the solar pathway impressing itself upon the psyche and physiology of humanity like an embedded suntan. It's amazing how many people do not consider the possibility that the sun has an ability to sunburn or suntan its image on deeper levels of the body, mind, and perhaps for the theologically-minded, the soul...H.O.B. Summarizing, most people seem to agree that Pythagoras introduced a strong geometrical emphasis that would, for instance, associate three with a triangle. It is not clear if the three has strong associations with a triangle in other cultures. People seem to agree that the Semitic use of the number three includes rhetorical significance (consistent with our straight line model), but not the more mystical meanings that a triangle might suggest. Butler, Christopher, Number Symbolism, Routledge and Kegan Paul, London, 1970.
 Cooper, J. C., An Illustrated Encyclopedia of Traditional Symbols, Thames and Hudson, 1978. Dudley, Underwood, Numerology, Mathematical Association of America, 1997. Farbridge, Maurice, Studies in Biblical and Semitic Symbolism, Ktav Publishing House, New York, 1970. Hopper, Vincent Foster, Medieval Number Symbolism, Cooper Square Pub., New York, 1969. Liungman, Carl, Dictionary of Symbols, ABC-CLIO, Santa Barbara, 1991. Schimmel, Annemarie, The Mystery of Numbers, Oxford University Press, New York, 1993.